I made this picture with my vintage 1940s CiroFlex camera. The bride was standing above the shore at the marina, the ocean behind us. For this photo, I wanted to see the city behind the bride. 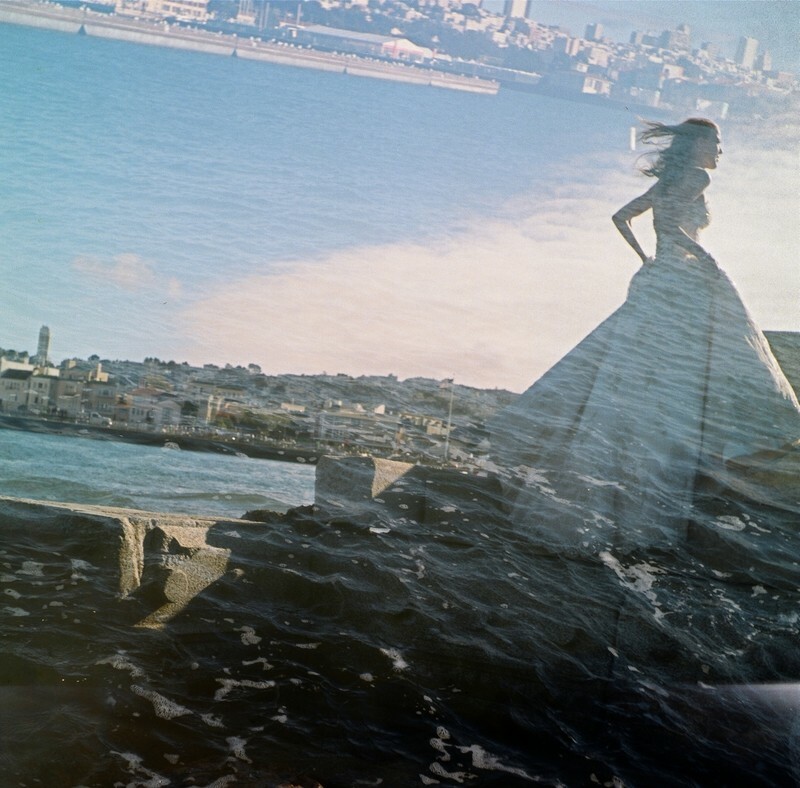 I took a photo of the water and a photo of the bride on the same frame and got this double exposure. It's my favorite color portrait of a bride I've ever taken, and it wasn't taken on her wedding day. When I do a post-wedding bridal session, I have extra time to try new things with film and experiment. According to Wikipedia, "The Wave Organ is an acoustic sculpture constructed on the shore of San Francisco Bay in May 1986 by the Exploratorium." It's a really unique sculpture with pipes and concrete. As the water comes and goes, it creates sound in the pipes. I loved photographing there because it's not a common location for wedding portraits. The bride and groom had hired us to do a post-wedding session in San Francisco. They decided to do a post session because we didn't have very much time for pictures on the wedding day. Also, their wedding was at The Century in downtown Modesto, which is an indoor, urban location with romantic lighting and brick walls. We did the session on the ocean because it was so different than their wedding, and it gave them more variety in their wedding album and prints. Location: 83 Marina Green Dr, San Francisco, CA 94123. Keywords: Bride (21), Day After Session (9), Double Exposure (3), San Francisco Bay Area (6).